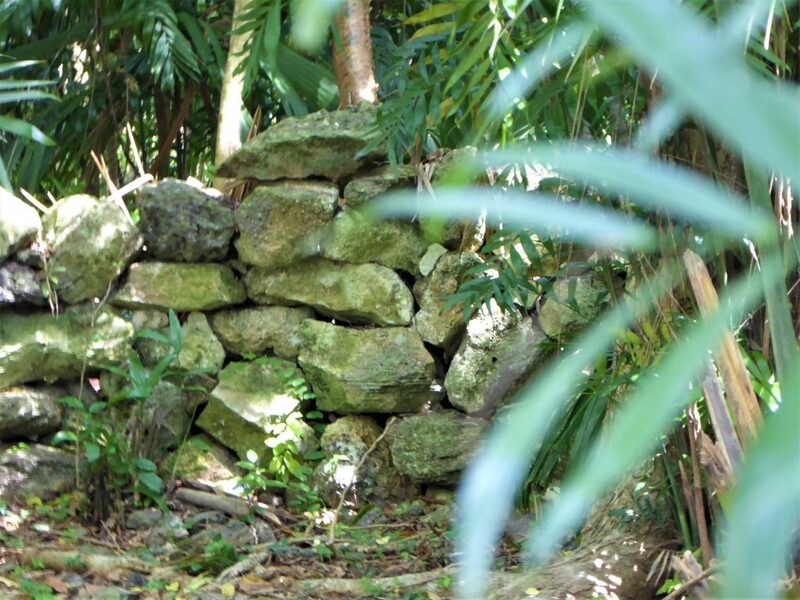 Tucked away on the island of Cozumel lie ruins where the Mayan people worshiped the fertility goddess, Ix Chel. The ruins are not as vast and impressive as Chichen Itza, Tulum or Tikal. However, they were significant for the Mayan women. 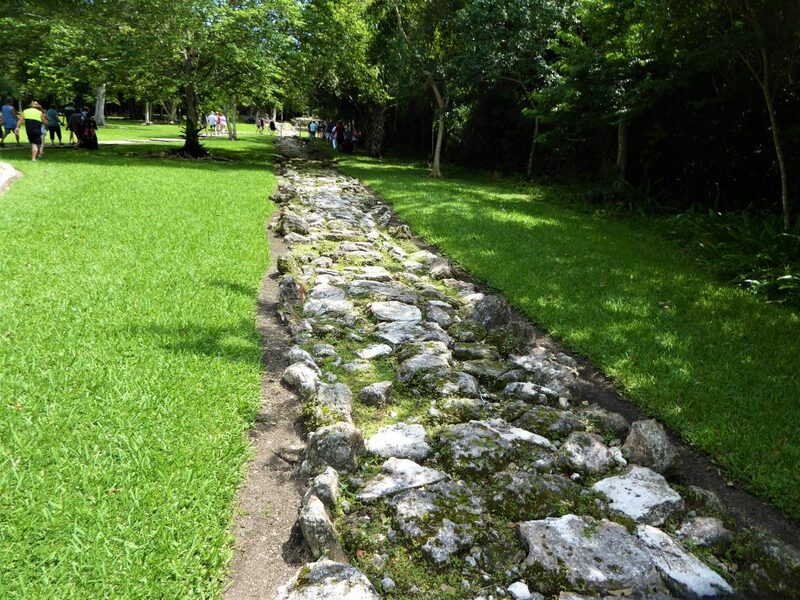 We visited Cozumel and toured the Mayan Ruins of San Gervasio. 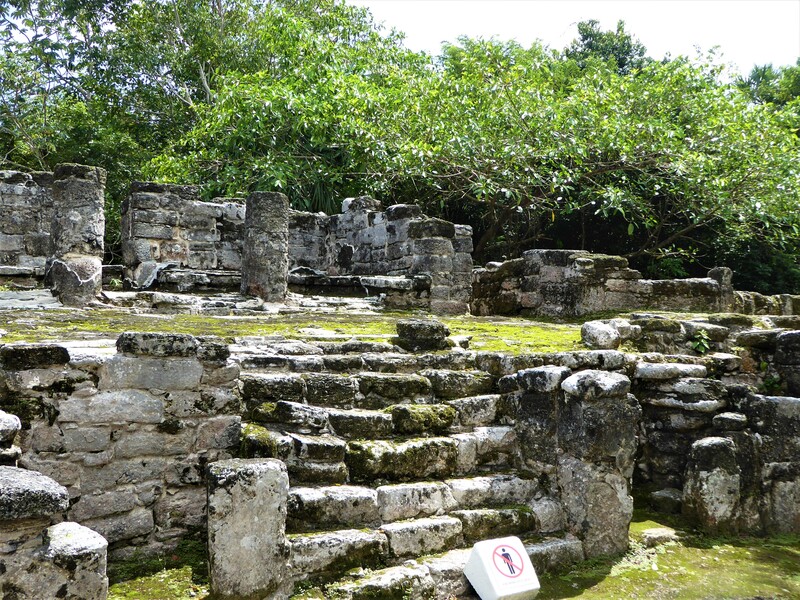 We enjoyed seeing the ruins, learning about the white road to the site, and exploring the culture of the ancient Maya. 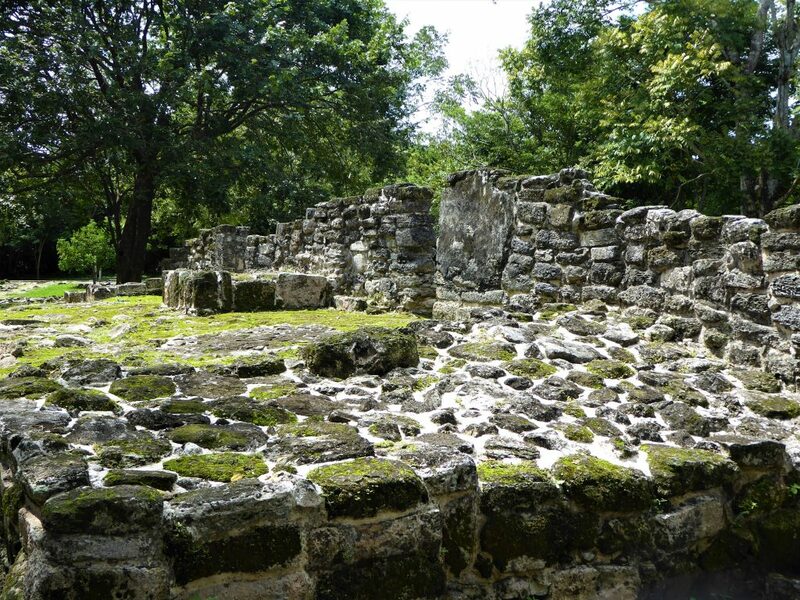 The Mayan women journeyed once in their lives to the Mayan Ruins of San Gervasio. Here, they presented offerings to the goddess, ensuring a successful, fertile marriage. If unable to visit the ruins personally, the women would send their offerings to Ix Chel with other pilgrims. This makes the ruins extremely significant cultural finds. The Maya called the site Tantun Cuzamil, meaning Flat Rock in the Place of the Swallows. Cozumel is a Mayan word for “place of the swallows.” Visitors can see swallows and many other birds on the island today. We visited Cozumel during a cruise. Our tour of San Gervasio, which included stops to El Mirador Beach and the Mayan Cacao Company, left from the International Port in San Miguel, the island’s only city. The bus ride from the pier to San Gervasio about 20 minutes. 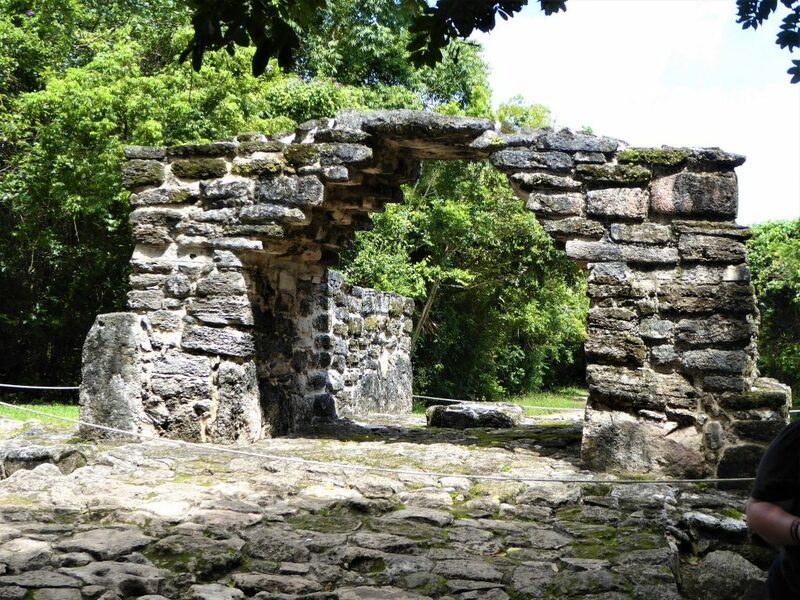 San Gervasio is in the tropical forests of central Cozumel. The archaeological site was once a farm, owned by a farmer named San Gervasio, thus the current name of the site. My wife and I toured this site years ago. Then, we reached the site on a dirt road. On that trip, there were few ruins unearthed. We rode in the bed of a pickup truck to the ruins. Fourteen years later, my son and I toured the site, where many changes had occurred. First, the dirt road is now fully paved. More ruins have been unearthed, and some have been constructed based on findings by archaeologists from Harvard and the University of Arizona who mapped the area in the 1970s, providing the blueprint for some of the reconstructed structures. The site is now operated by the National Institute of Anthropology and History. Multiple tours of the site operate daily. You also may purchase admission and tour the ruins on your own. We were part of the cruise tour with about 30 people, led by a docent who provided a one-hour tour of the site. 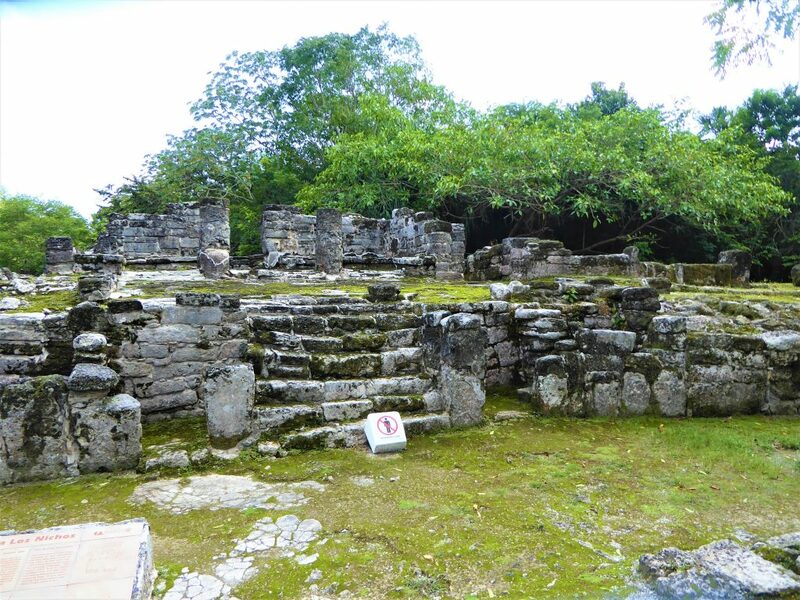 During the tour, our docent explained the history of the Maya people, spoke of other archaeological sites, and explained the mathematical expertise of the ancient people. 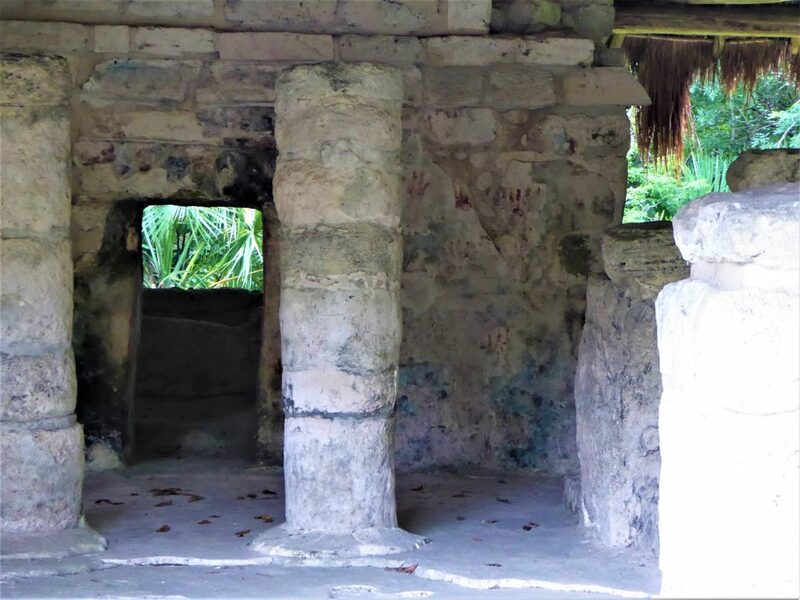 Throughout the tour, the docent explained how the cycles of the sun and moon played such an important role in the architecture and faith of the Mayan people. Interestingly, we learned how the number 28 (the number of days in a moon cycle and a woman’s menstrual cycle) played a significant role in the architectural features of San Gervasio. We also learned about the advanced mathematical acumen of the Maya. The Maya used three numbers – a zero, a dot for one, and a bar line for number 5. With these three numbers, they were able to calculate from 1-19, using the zero as number 20. The impressive system was integral in counting the cycles of the moon and sun, the solstices, and other astronomical phenomenon. 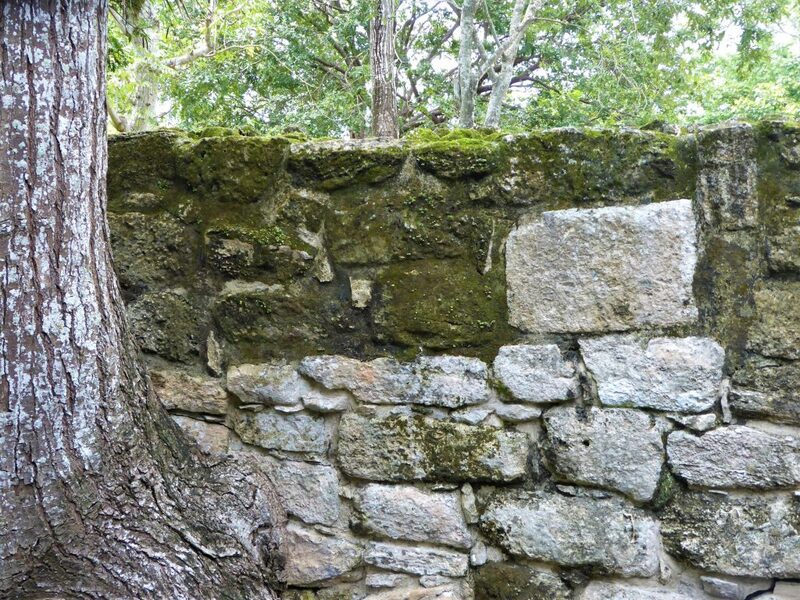 The Maya employed the number system in their architecture too, which we saw throughout the tour of the ruins. Underground waterways, called cenotes, prevail in Mexico. Cozumel is no exception. 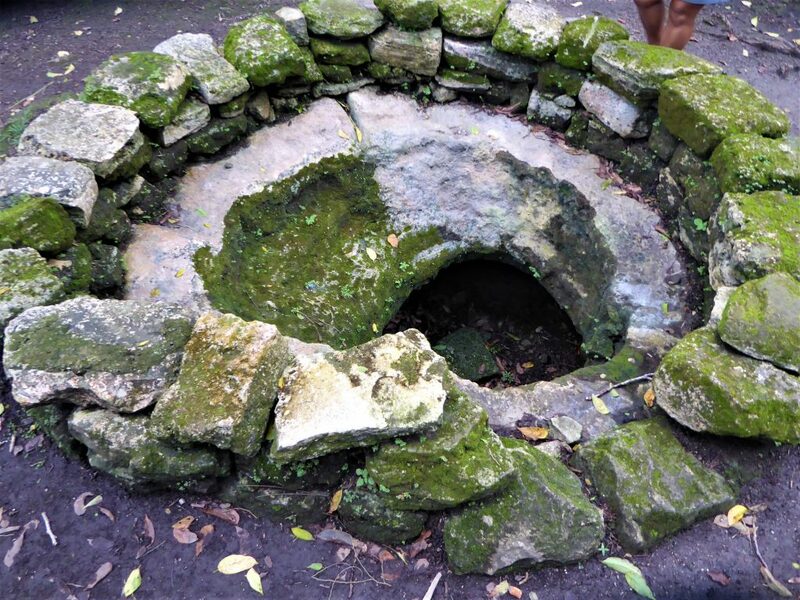 The site has a fresh water cenote which the ancients used for their water needs. This cenote is no where near the size of the massive cenote of Chichen Itza. 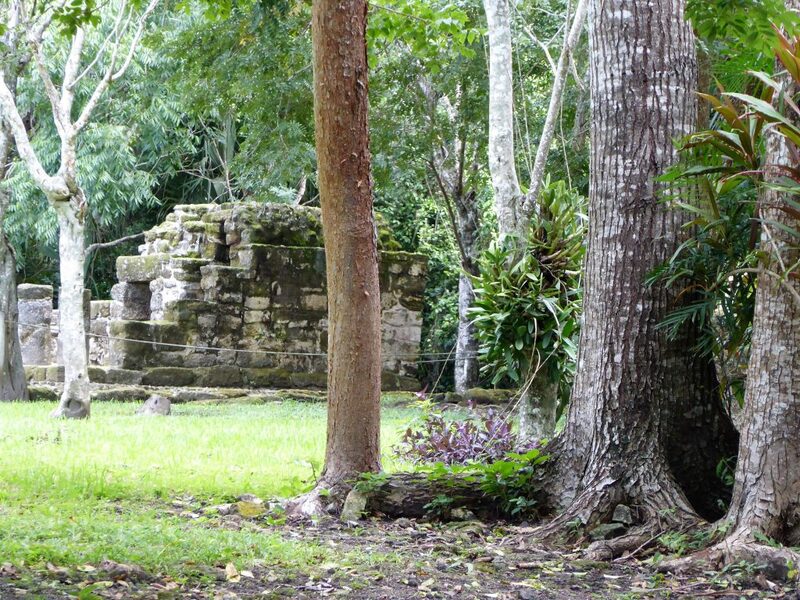 It offered, however, a great stopping point to talk about the religious history of the Maya. Most people know about the human sacrifices at Chichen Itza. We have heard about the sacrifice on a female virgin during the summer solstice, and the “basketball” games in which the winning team gave up their lives to the gods. Recent evidence is changing our understanding of these sacrifices. The archaeologist uncovered human remains at the Chichen Itza cenote suggesting sacrifices of babies and older men and women too. So our ideas of sacrificing the most athletic or the most beautiful young virgin may need revising in the future. Our tour bus took us to the entrance of the park. As we entered the park, we were able to take our photo with a woman dressed as Ix Chel, the fertility goddess. When leaving the park, we were offered the picture for $15 unframed, or $20 in a frame made by the local descendants of the Maya. Before entering the park, we passed several vendors, restrooms, and a small cafe with snack foods. Then it was time to enter the park and head to the structures. The first structure on the tour was a mound with layered bricks. The structure served as a chapel for the ruling family of the area. The Maya had a very stratified class system, including peasantry and nobility. Later in the tour, we learned that the nobility were often cross-eyed because at birth the parents would harness the head to bind the skull, eliminating the babies soft spot. The harness jutted out from the head within the babies view. The baby would look at this harness, and many became cross-eyed from this. While not as populated as Mayan cities, Tantun Cuzamil was a sizable village with a number artisans, workers, and leaders. 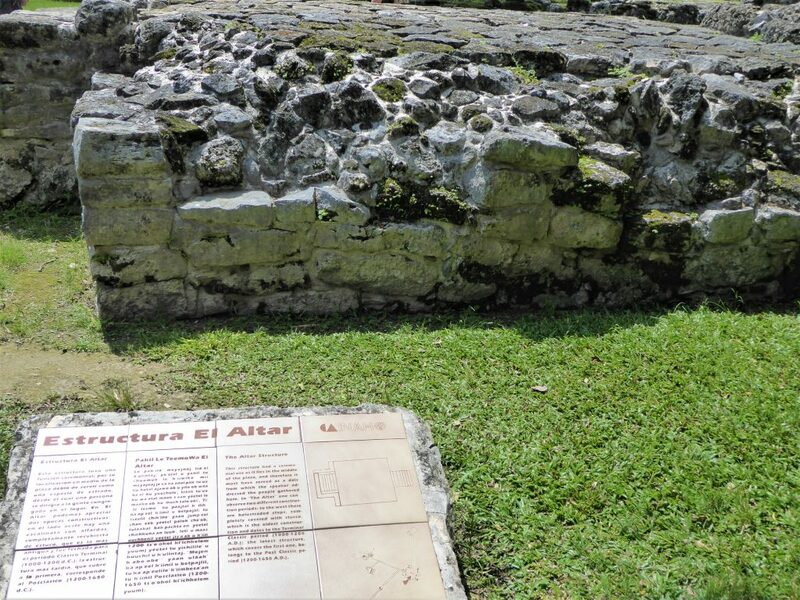 The final resting place of either the priests or the regional ruler of the Maya. 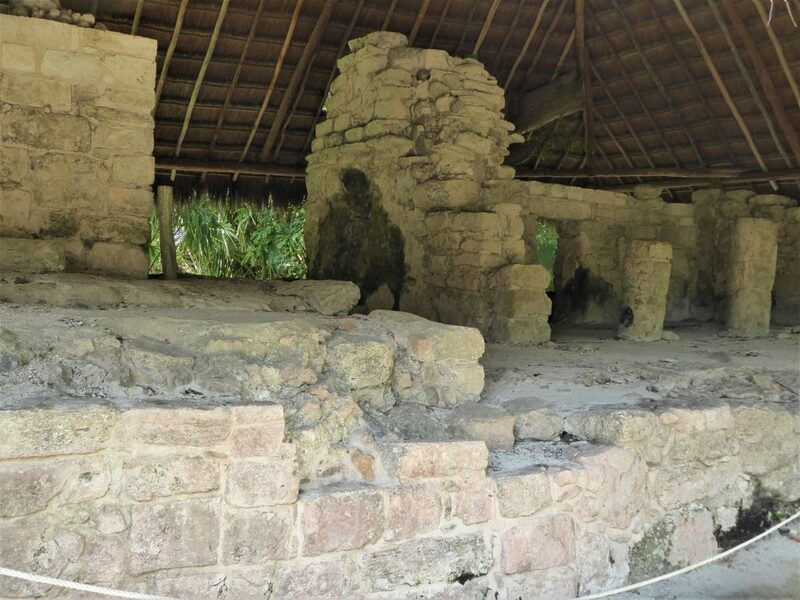 This was the residence of the Mayan ruler of Cozumel, the halach unik. The structure gets its name from the red hand prints one sees in the building. The building has an outer room that served as the ruler’s residence, and an inner shrine room. Cozumel is a tropical island with tropical and semi-tropical vegetation. 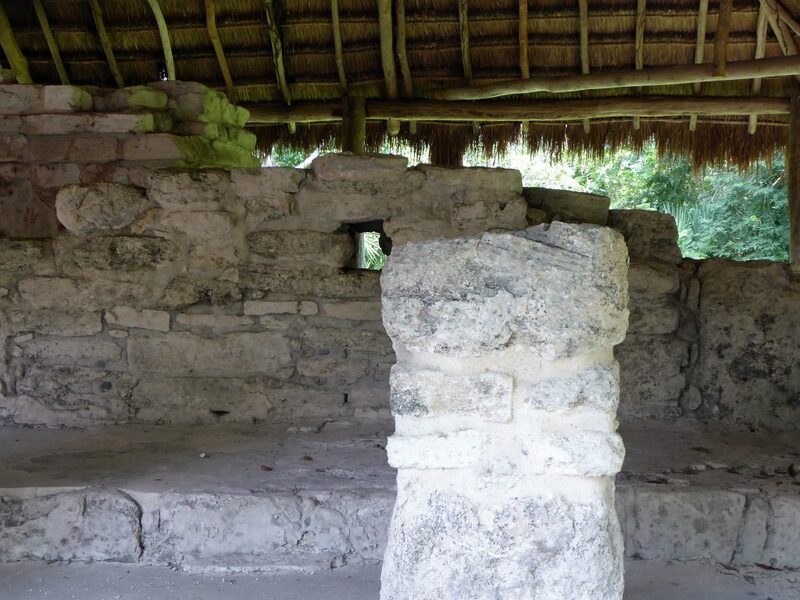 Cozumel had no horses during the Mayan period. The inhabitants traveled by foot everywhere. Cutting through the heart of San Gervasio is part of a nine-mile road made of lined rocks. The road was painted white to help reflect the moonlight during the evening. It must have been reassuring to see the road and know that you were headed on the right path. 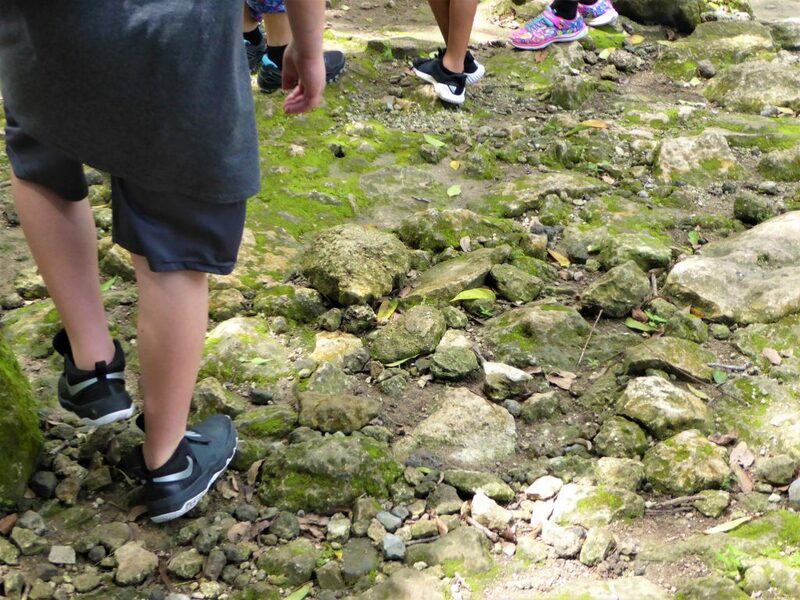 We appreciated walking on the white road, imagining what life was like for the Mayan who traversed the path 1000 years before us. The white road cuts straight through San Gervasio. Bridging the road, El Arco is an arch that pointed to the entrance of the city and religious center. El Arco bridges the White Road. The arch is divided into four sections, each section with six levels forming the arch topped with a seventh section. The sections add to 28, representing the days in a moon cycle and a woman’s menstrual cycle. Very fitting, given that the region was dedicated to the worship of the fertility and marriage goddess, Ix Chel. We walked along the White Road to the central plaza, where six buildings form the perimeter of a town square with an and a central altar. This was the central location for town life, and includes the temples for Ix Chel and Ku’kul’kan, the feathered serpent god. District 1 Central Plaza consists of building around a town square. The archaeological team is working endlessly to uncover ruins on the island. We were told that about a mile from Central Plaza is a recently discovered site where archaeologist are working. This site is not yet opened to the public, but may open sometime in the future. 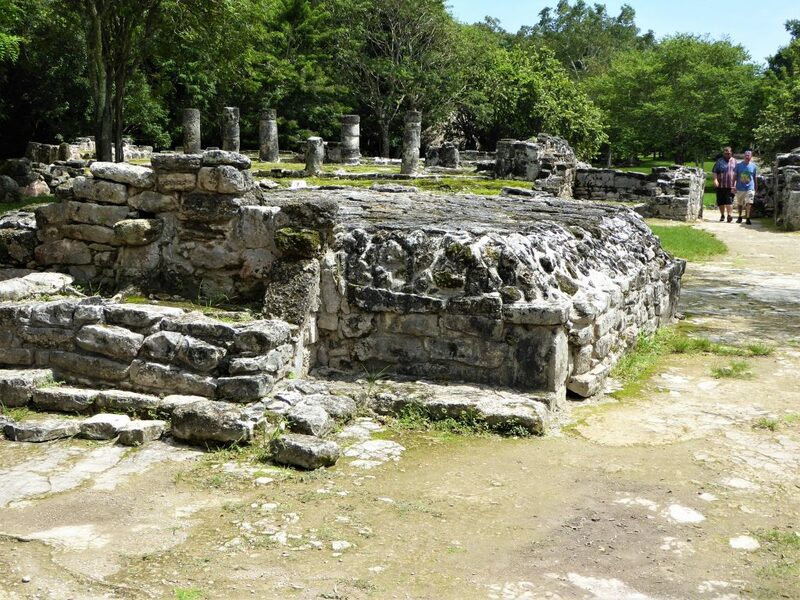 Temple dedicated to Ix Chel, the fertility goddess. 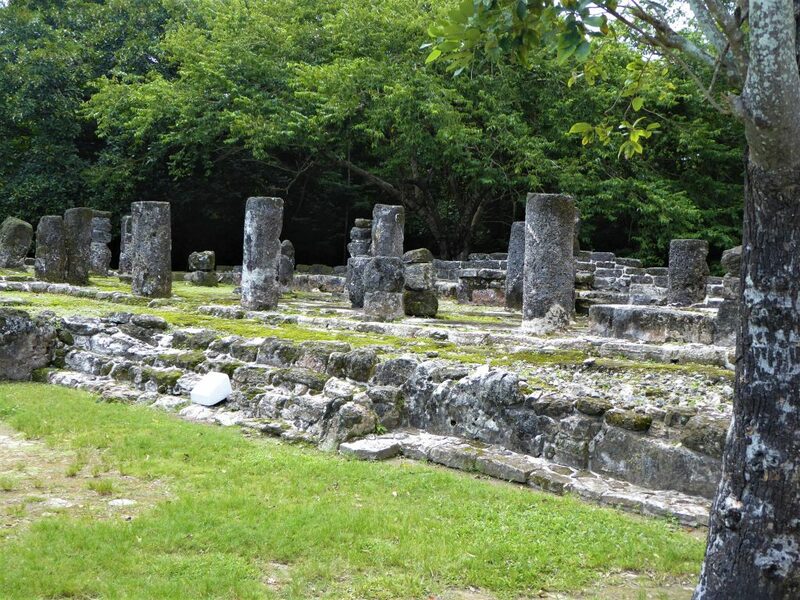 The San Gervasio ruins cover four districts, but tourists can only visit District 1 and its nearby structures. Though this limits the ruins a visitor can see, it still provides opportunity to see the structures, and to catch sight of some wildlife. We spotted an iguana during our visit. 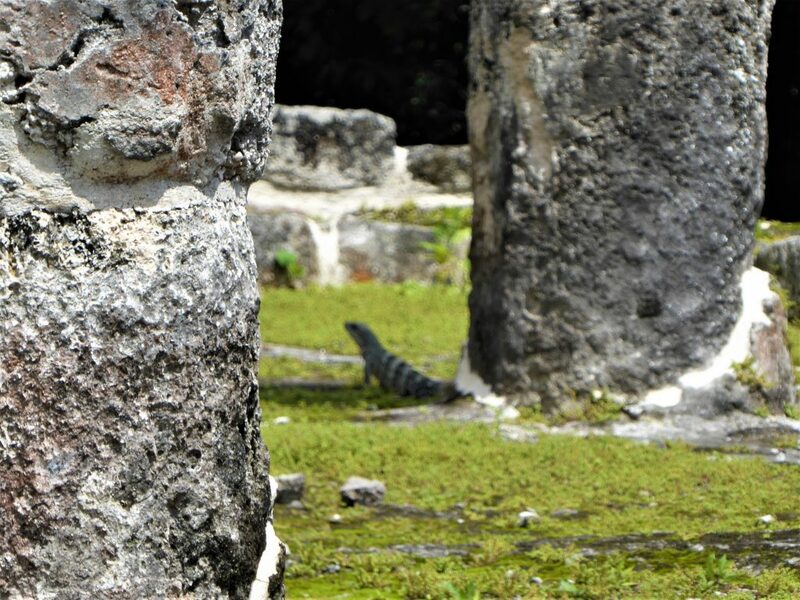 The park is also a designated wildlife refuge, so it’s not uncommon to see iguanas and other island animals. When we were ready to leave the District 1 plaza, our tour docent told us about some of the natural resources indigenous to Cozumel. One item is black coral, and you can of course purchase black coral jewelry from the shops at the park’s entrance. As our tour ended, we had 20 minutes to use restrooms, purchase snacks, and browse the gift shops. Since my son heard about the black coral, he wanted to buy a black coral necklace. He also chose to buy a ceramic jaguar. The jaguar symbolized safety to the Maya. While we bartered and got a “special price” for being friends of our tour guide, I felt that we were still overcharged. But, our purchases did help support the local economy. Interested in more tourists attractions in Cozumel, Cancun, and Playa del Carmen. Check out this travel guide. 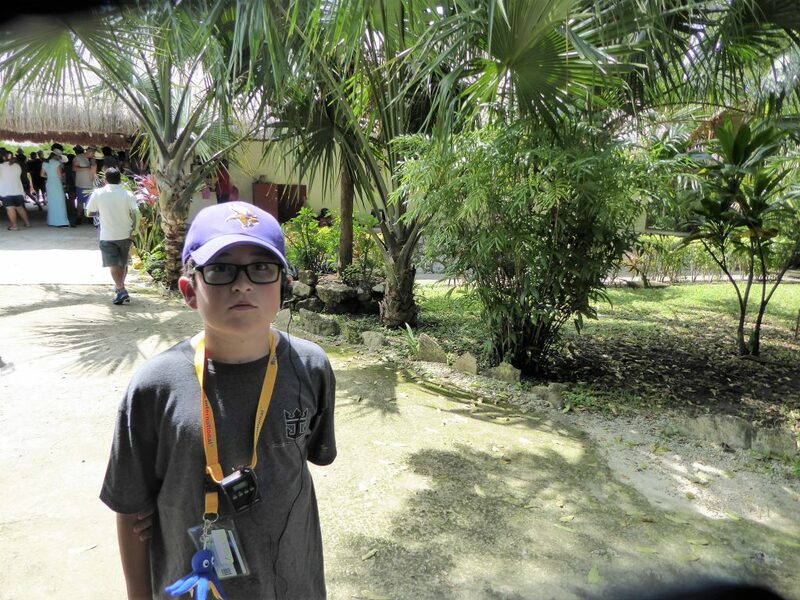 Our kids also made this video, featuring some of the pictures and sites we saw at San Gervasio. Enjoy. Our complete guide to the Ancient Cliff Dwellings of Mesa Verde. Read about our adventures on our very own Family Archaeological Dig. I loved visiting Chichen Itza years ago. 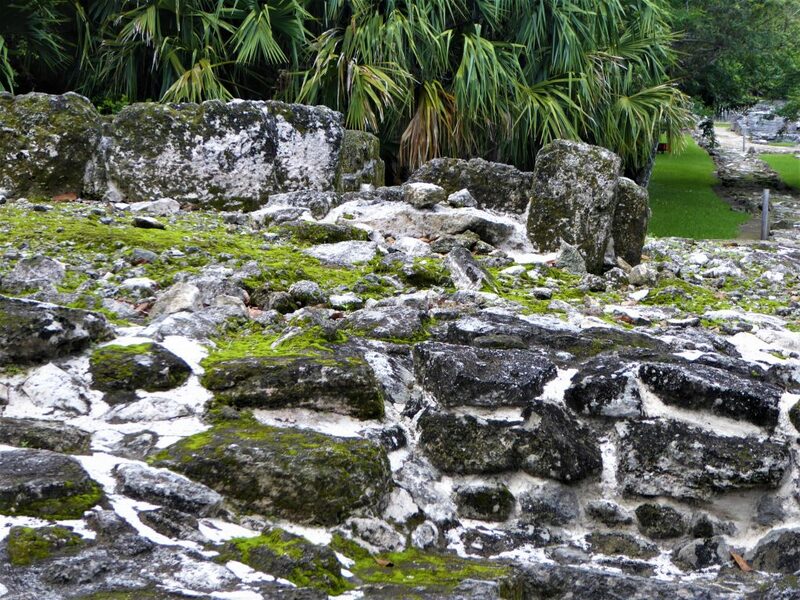 Cruises give a great opportunity to visit many Mayan ruins. I can’t believe we skipped these when visiting Cozumel. I knew the ruins were there, but we’d already seen so many ruins in our trip, we decided to skip these. But in your pictures, these ruins look so well. And there are so many interesting stories about the ruins! Guess we’ll have to go back to Cozumel someday! There certainly are plenty of things to do in Cozumel. It was a fun, informative visit. We are always ready for a return trip to Cozumel. We are visiting Cozumel in two months. San Gervasio is now on the list of places on the list of places to visit. I love Mayan ruins. When I was at Tikal, they said the white roads were important for defense too since you could see approaching foot traffic, even at night. It’s fascinating how advanced the pre-Columbian Mesoamerican cultures really were. Yes, the cultures were so advanced. We love Cozumel, and enjoyed many great stops this trip (posts are coming soon). I had not heard about the white road helping out with defense too. Very interesting. How interesting! I had not heard of these ruins before. You provided an excellent history lesson and unique insight into the culture of this civilization. In some ways, they were very advanced. Thanks for sharing the information. Thank you. We really enjoy learning about history during our travels. Off late have developed huge appreciation for places such as these as have visited quite a few of them. Its like one gets transported to another time and age. 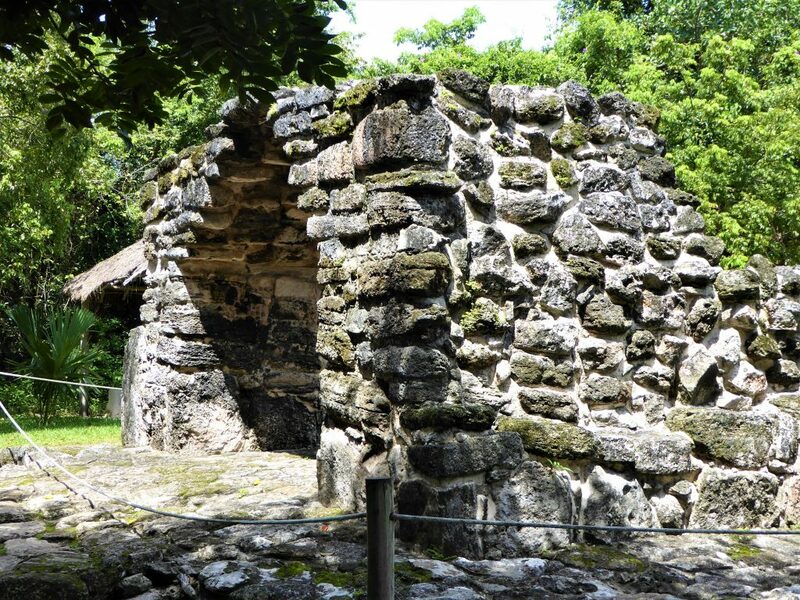 The Mayan Ruins of San Gervasio is like a window to the Mayan culture and architecture. Lucky that you got to see this site twice, with a gap of 14 years to share how things are different now. Truly loved reading about the Mayan beliefs, expertise and cultural history here and hope I get to see fascinating place one day. Loved the pictures too and they were sort of a virtual tour for me. So happy you enjoyed our virtual tour. Maybe one day you can experience the ruins in person. I’m a fan of archaeological sites. I love making discoveries in the past and learning about people’s culture. I think this place is necessarily on my bucket list. Hope you get to see it. Enjoy. We started to plan a trip to Yucatan and Guatemala for next summer, but apparently the summer heat is unbearable, so we decided to put off this trip. But we’ll certainly go there during winter in a couple of years. It’s good to know about San Gervasio, since it’s less touristy and more authentic compared to the major archaeological sites. I’d love to know more about the recently discovered site not far away from the Central Plaza. So I’ll make sure to contact my fellow archaeologists there before going. Thank you for sharing this. Maybe you’ll be among the first to see the new site. Enjoy. I’ve never heard of San Gervasio before, so this was a really great read for me. I’ve done the other biggies in Mexico. Can you imagine walking the 9 miles on those uneven rocks? Makes my back hurt just looking at it! 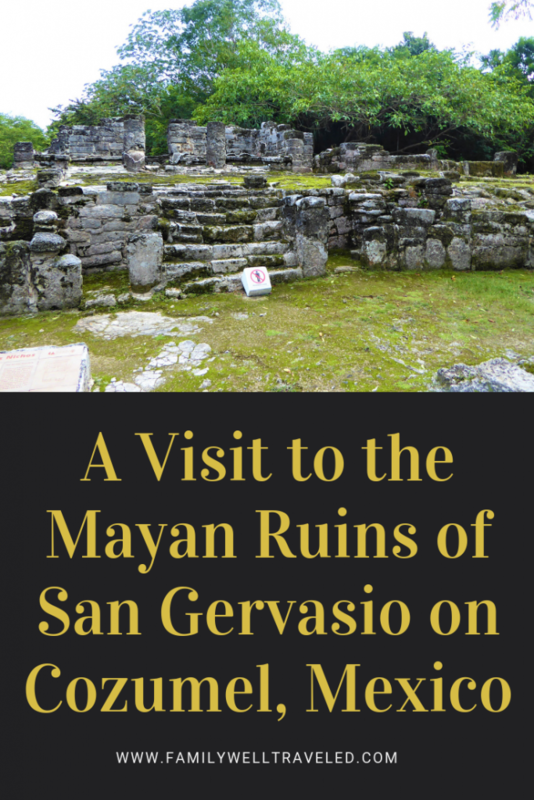 I’ve heard of Chichen Itza but not heard about the ruins of San Gervasio before this. I’m always fascinated by history and archaeology so loved this post. Fascinating to learn about the nine mile white road and the ruins with the red painted hands. Any idea what those red handssignify? I hope I can visit someday. Thanks for sharing. We’re in Mexico right now, so this came at the perfect time! We’re hoping to visit the Yucatán Peninsula in a few months. We’ll definitely consider visiting these ruins. Fantastic. We love Yucatan and Quintana Roo.